Bro Gilbert is doing magicians a real favour with his series "The Vault", which collects a growing number of his favourite effects and videos, all available by digital download. He's worked closely with Paul Harris, so it's no surprise that a number of Paul Harris tricks are included. Paul Harris is highly regarded for his 9 DVD box set True Astonishments, and there's some terrific material within - if you can afford the $300 price tag! So it's good news that with the help of Bro Gilbert some of these great effects are being released separately as part of "The Vault". 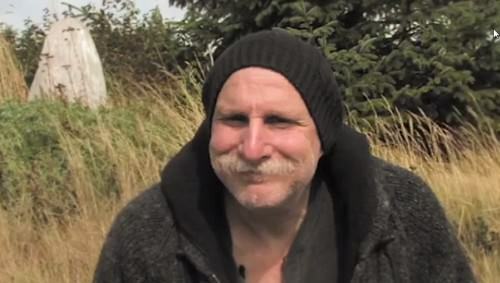 Few of Paul Harris' tricks are more special to Bro Gilbert than "Dr Fun", which is named after his own Dad, who shared his love for fun with seniors at the extended care facility where he worked. In the "Dr Fun" routine, Paul Harris aims to get people into a positive state of happiness by drawing on a special memory from their lives, making them feel good by having them recreate this happy memory. It's a simple yet amazing prediction effect! First you write down a word on the face of a card, and then your name on the back of that card, which you place on top of half the deck - this will now be held by the spectator the entire time. The spectator is now asked to think of a great personal memory they have, and then describe how it might look if turned into a simple picture. While they describe this, you draw this as a picture on a playing card from the other half of the deck, and get the spectator to write their name on the back of the card. Then for the first time the two cards are revealed - first the one with their name and your drawing, and then the card with your name. Amazingly, on the back of the card with your name is written something about the picture - even though that card has been in the specator's hand the whole time, and before they even shared anything about their memory! What you get for around $10 is an instant digital download of the video, which demonstrates and teaches the routine. You can play the video via streaming, or download it in *.mp4 format to view on your computer with any video program. The entire video is less than 10 minutes long, and the downloaded file is about 83MB in total size. The two minute performance in the video download has zero patter, and only includes a visual run-through of the routine. While this makes clear what is actually happening, it does miss the human interaction that is one of the most important and powerful parts of this routine. Definitely do watch the trailer with Bro Gilbert performing the routine, because this really helps show what the trick looks like in the real world, since the conversations and memories that this effect is all about are critical to the strength of the routine. I wish the trailer with Bro Gilbert's terrific performances had been included as part of the video download, either at the very beginning or as a separate file, but fortunately you can view it online easily enough. People familiar with the Art of Astonishment set will know that the teaching method is somewhat unorthodox, in that no words are spoken. Instead, with some light background music gently rolling, the routine is demonstrated with an overhead view that focuses closely on the hands and cards. Instruction is provided with written text on the screen, which explains everything going on. While unconventional, I was impressed how well this works to teach, especially because the words are written on the screen and you can pause at any moment and still see the key points. Given that the moves required are fairly straight forward anyway, everything is easy to follow. Thumbs up from me! 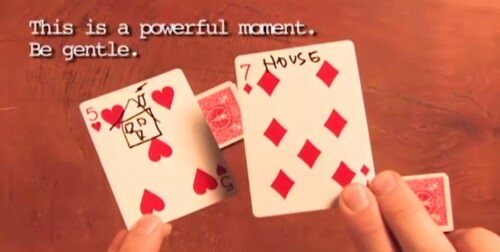 No gimmicks are needed to perform this trick - all you need is an ordinary deck of cards and a sharpie/permanent marker. A small amount of set-up is needed, so it can't be performed entirely impromptu. But you can easily get set-up if you get a few moments to yourself - in most cases it should take you less than 30 seconds to get ready to go. 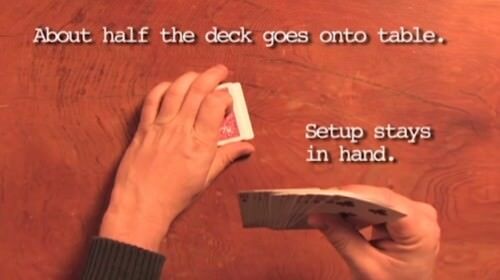 No real sleight of hand is required, so this routine is well within the scope of beginner magicians. You just need to be able to keep track of where all the cards are and what you need to do when, since positioning of the cards is important. So you will have to practice to make sure you can do everything required and remember exactly how to place everything at the right time. But it's not a difficult routine, nor is it intended to be a magician fooler - it's something relatively easy that is designed to have a positive impact on lay people through the memories it recaptures. In his introductory comments, Paul Harris explains how the recreation of a happy memory is one of the main aims of this trick, and that it's important to let people talk about that, listen carefully, and not end that phase too soon. That's exactly what I really love about this routine. It's not just about entertaining through magic, but is about bringing your spectator back to a state of happiness by connecting with something very personal for them. This actually helps make the magic stronger, and it not only makes your trick memorable, but helps your spectator genuinely feel good and positive about the magic and about themselves. It's really important to emphasize at the start and end of the routine (before the final reveal) that the card you place on top of the spectator's pile is placed there before anything else happens. While not difficult to perform, you do need to make sure you get everything right, so that you can on enjoying the interaction with your spectator, which is key to this track working at its best. The method isn't something that will leave magician's fooled, and nor is it intended to do so. Paul Harris has designed this to really tug at the emotions of the average lay person, and I think he's really accomplished that beautifully. It's easy to underestimate the impact of a trick like this. Some magicians might see the routine and dismiss it as too easy to figure out, and certainly it's not something likely to fool a working magician, especially if you watch the routine more than once. But there are some small nuances about how to perform this that are included in the video download, so I'm glad I didn't just try to reverse-engineer the trick, since I would have missed some key elements and touches about performing it well. Furthermore, the real impact of this trick lies in the material it taps into, namely the personal memories and emotions of your spectators, which really heightens the magic. Paul Harris is considered a legend in magic, and this trick is a fantastic example of something quite simple that can really astonish and amaze. I'm glad that some of the gems from his Astonishment set are being made available for purchase as individual downloads for those of us who don't have the boxed set. Dr. Fun is a lovely routine, and kudos to Bro Gilbert for selecting it for separate release. It's a wonderful tribute to the fun person his dad must have been, and I'm glad that with this trick we help can spread fun into the lives of others! I liked this effect when I first saw it on the TA set. Yes, there's some great stuff on the True Astonishment set, and it's nice to see some of it getting in the public eye again as individual digital downloads. What would be your favourites from the entire set Tom?